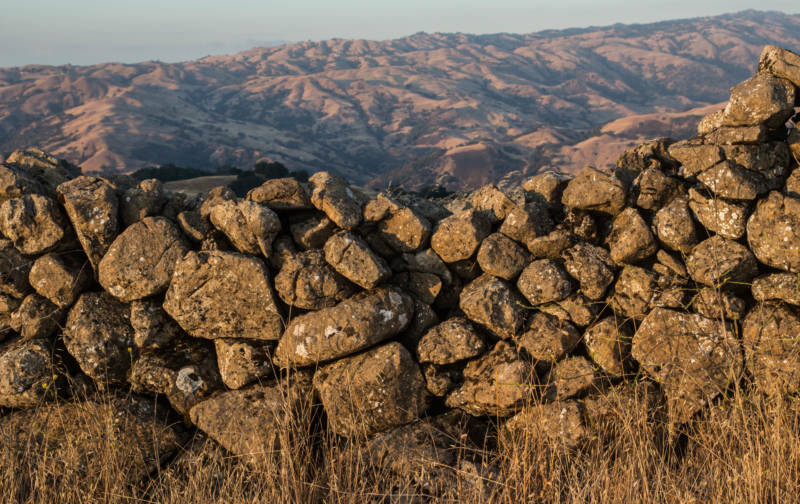 or more than a century, people in the Bay Area — and especially the East Bay — have puzzled over the existence of stone walls scattered on ridges from near San Jose north through the Berkeley Hills. Sometimes the walls are built in long straight lines. Sometimes they form angles. Occasionally you’ll find rectangular or circular constructions. Who built these things? How long ago? And why? Maybe voyagers from a lost continent built them. Or visitors from outer space. Or a vanished tribe of "superior" Native Americans. People have suggested these walls could have been meant for defense. Or as navigational aids for extraterrestrials. We started getting “mystery walls” questions almost as soon as Bay Curious opened for business, including one from Eric Haven. He’s an artist — he writes and draws graphic novels — and he's been a producer on “MythBusters” as well as the reboot, "Mythbusters Jr." So he’s someone who wants to get to the bottom of things. His query was pretty straightforward: "Who built the East Bay mystery walls? They appear to be ancient, many hundreds or even thousands of years old." "And the way it was relayed to me was very much like urban myth or urban legend," he said. "There are certain signifiers of that conversation — you know, the vagueness of it — and yet certain things are very specific. ‘No one knows who built it. No one knows why they built it.’ "
hat "no one knows" refrain is a constant in the story of the walls from the beginning. It’s hard to say precisely when locals might have started gossiping about the walls — or if they ever did — but the oldest published mention of the “mystery” appears to be March 8, 1896, in the Sunday San Francisco Chronicle. "Half a mile east of Grizzly Peak stand the remnants of stone walls which have long baffled the researches and curiosity of antiquarians," the unbylined story said. "By whom they were erected, when and why is an unsolved mystery." The same little essay goes on to drop a theory or two: that perhaps the walls were the work of what it called “a long forgotten race," or maybe the Aztecs of Mexico, who might have used the walls for defense. For structures that have excited such feverish speculation for so long, most of them look pretty modest. The section Eric Haven and I tramped up to is actually kind of nondescript: about 100 feet long and just 2 or 3 feet high. The rocks used for construction — local limestone — are stacked or piled, not mortared or cut to fit. Most of the stones are small enough that one person could place them easily; some would have required a crew to put in place. Most are covered with lichens. As we soaked in the atmosphere of the place — a spot with a sweeping view, but one we promised the property owners we wouldn't disclose — Eric shared a friend’s idea about the origins of the walls. It’s a variation on the notion that Native Americans built these walls for a mystical purpose. "His theory was that there was an earthquake here, and it opened up fissures in the ground," Eric said. "And he thought these were purely ceremonial. They were here to appease whatever gods they thought were angered, or spirits, and this was a way to mark those fissures and to show those spirits they’d do whatever it takes so the earthquake doesn’t happen again." Before we headed back down the trail from the wall, we observed that the wall runs parallel to a modern barbed-wire fence that pretty clearly marks a property boundary. So this wall, perhaps, was built as part of a property line. ooking for an answer meant going through old newspaper stories, tracking down amateur sleuths' accounts of the walls, searching old maps for evidence of the structures and finding out whether real live archaeologists had ever studied the walls. There have been many newspaper pieces over the years, starting with the Chronicle's in 1896. Most have repeated the original article's conclusion that the walls are an impenetrable enigma. For instance, in August 1904, the Chronicle ran another story on the walls, this time, as a big spread in the Sunday paper. It featured a dramatic illustration of stereotype savage fighting with spear and bow and arrow and hurling big rocks. It was written by a guy named Harold French — a hiker, writer and clerk at San Francisco's U.S. Mint. The prose sounds a lot like that in the 1896 piece. Harold French's August 1904 feature in the San Francisco Chronicle on the 'prehistoric' East Bay walls. "Did a colony from lost Atlantis once populate the Berkeley hills?" the story asked. 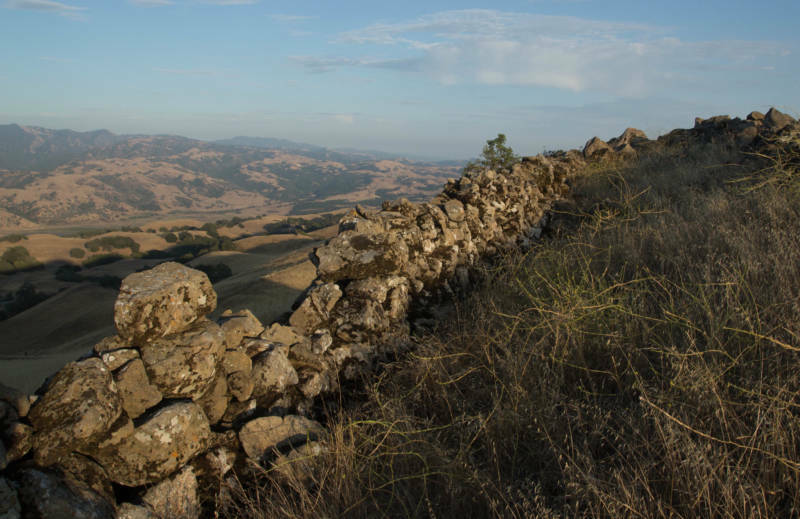 "Are the ancient rock walls which crown the Contra Costa ridges remnants of a Toltec or a pre-Toltec civilization? Are these remarkable walls really relics of the Stone Age?" A few weeks later, the Chronicle was back with another dramatic Sunday spread, announcing an amazing find unearthed by a University of California chemistry professor named Henry Coffinberry Myers. The headline declared that "stone age relics discovered in the Berkeley Hills ... seem to change the accepted history of the Western world." The objects Myers said he'd uncovered during forays into the hills included a "five-faced stone image," stone axes and pieces of pottery. Myers said that mineral deposits on the carved stone image proved it was 1,000 to 10,000 years old. Myers and other experts the Chronicle contacted said the artifacts and the walls in the hills were evidence that early hill dwellers — perhaps giants who had gained immense strength by lifting big rocks — had migrated from China. Myers' find was almost certainly a hoax. The Chronicle doesn’t appear to have said another word about the professor and his world-shattering discoveries. Myers left Berkeley shortly afterward to manage a sugar refinery in Hawaii. He eventually donated his artifacts — telling a different story about where they'd come from -- to a Bible college in Spokane, Washington. In 1908, the Berkeley Hills walls were back in the news. "Professor" Joseph Voyle, president of the Berkeley Society for Psychical Research, identified some of the walls as remains of a prehistoric civilization. He was led to the site by a kind of divining rod, and newspapers delighted in telling the tale of Voyle leading a group on an expedition into the wilds. hile Myers and Voyle departed the scene, Harold French showed up again and again in print over the years promoting the legend of the walls. I say "legend" advisedly. In published writings through the early 1920s, French never failed to describe the walls as "prehistoric" or "ancient." But beyond the walls' mere presence, the only evidence he ever cited was the testimony of unnamed old-timers who, he said, had told him that the walls had been a puzzle to both Native Americans and early settlers alike. "From time to time my students have come and told me about these walls ... but I never took them seriously enough to climb way up there in that 'Beanstalk Land' to see them. I suppose they are either old sheep corrals or ranch boundaries." An Oakland Tribune feature article on the East Bay Walls by writer and hiker Harold French. Eventually, though, amateur researchers started trying to decipher the walls. One was Seth Simpson, who spent years documenting the presence of the walls and puzzling over their origins. His conclusion, summarized in a 1972 number of Pursuit, the Journal of the Society for the Investigation of the Unexplained, is classic. ther wall fanatics were exploring the hills, too. Robert Fisher, a physician from Fremont, and a friend from Berkeley, Russell Swanson, took a lively interest in the walls, especially those in the hills near the south end of the bay. Fisher and Swanson were inclined to see massive rock formations on the ridges and highlands as the work of unknown ancients they called "the Earliers." The meaning of the walls, massive standing stones and outcroppings, was baffling. Fisher suggested some of the stone work could have served as navigational aids for extraterrestrials. 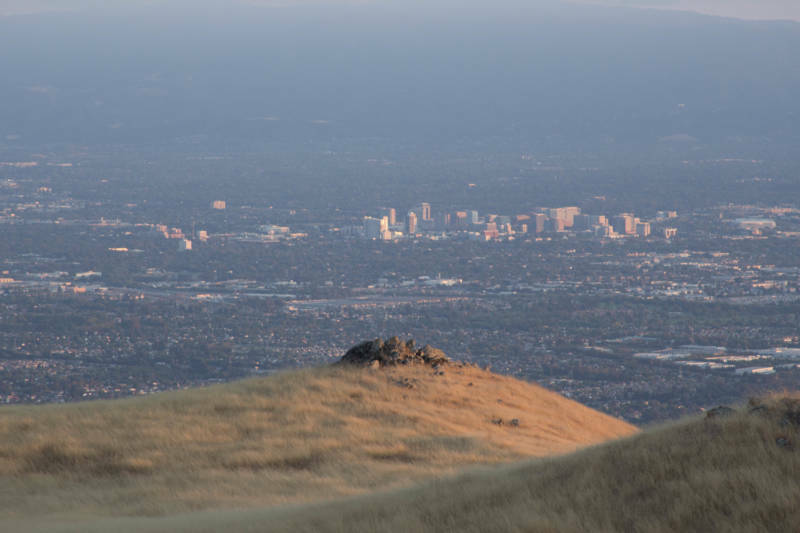 At least one real live archaeologist joined Fisher to tour one area of the hills — Monument Peak, above Milpitas in Santa Clara County's Ed Levin Park. It's a dramatic site, with wonderful stretches of walls snaking along ridges about 2,000 feet above the bay. In an answer to an email query relayed through the Society for California Archaeology, Breck Parkman, a now-retired state parks archeologist, said that in the late 1980s a friend prevailed upon him to visit Monument Peak with Fisher. Fisher "wanted me to come and authenticate what he was finding," Parkman said in an email. "... I said, show me the best you have. He did." Parkman said the area featured "lots and lots of stone walls" he believed dated to sometime in the 1800s. Most were built, he felt, in the later years of the century, perhaps by Chinese workers, perhaps by Basque sheep herders. But he found a handful of structures — possible hunting blinds and prayer circles — he thought could have been Native American in origin. 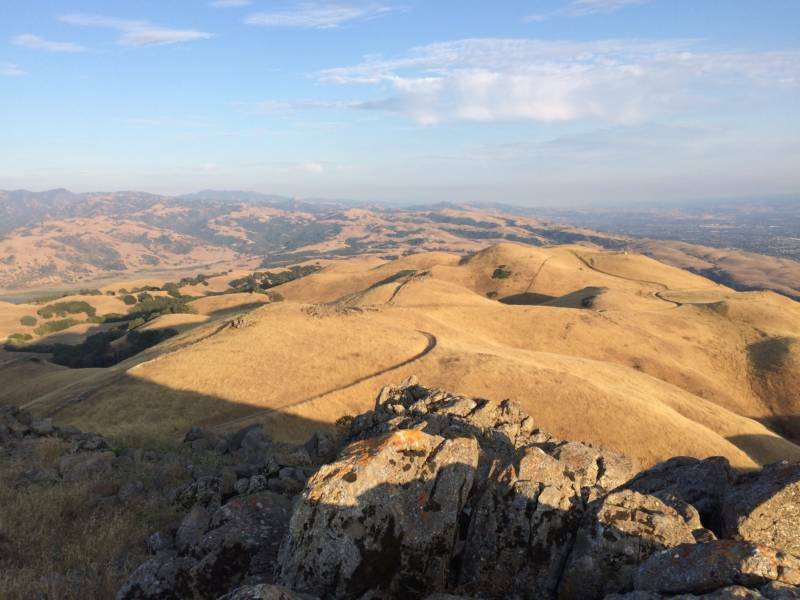 "It was these features that convinced me that among the many late 19th century rock features in the East Bay Hills, we might find a few older features of importance," Parkman wrote. "It would be worth checking out, but I don’t know who’d be interested in taking a systematic look at this." One reason that professionals may have stayed away from the walls, Parkman added, is "not wanting to be associated with the fringe element" responsible for the many wild wall hypotheses over the years. nother archaeologist, Jeff Fentress, went up into the Berkeley Hills with me to look at the same section of wall I visited with our question asker, Eric Haven. Fentress, now retired from his position as a professor of archaeology at San Francisco State University, was raised nearby and said he'd been hearing stories about the walls since his boyhood. 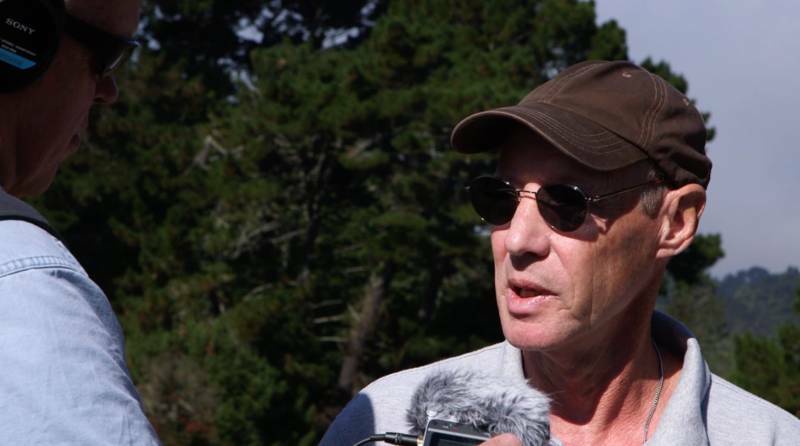 "When I was growing up in Berkeley here, we were told the Lemurians built the walls, and the Lemurians were the inhabitants of the lost continent of Mu," Fentress said. Mu is said to have existed out in the Pacific Ocean somewhere. And Fentress said stories like that are still coming up. The History Channel asked him whether a Chinese admiral might have erected the rock walls, and British TV interviewed him about whether the West African adventurers might have put up the walls during a visit 30,000 years ago. Fentress said the problem with all of those theories — Lemurians, Chinese, West Africans and extraterrestrials — is that there’s simply no evidence any of those real or imagined groups ever landed here. "So I think you have to look at the walls in the context of who was actually here in the Bay Area," he said. Native American tribes have populated the Bay Area for about 10,000 years, according to the latest estimates. They were here long before the arrival of Spanish and Mexican colonists and the Gold Rush-era invasion of Americans. But Fentress said "there is no indication that Native American people built rock walls that extended for hundreds or thousands of feet. 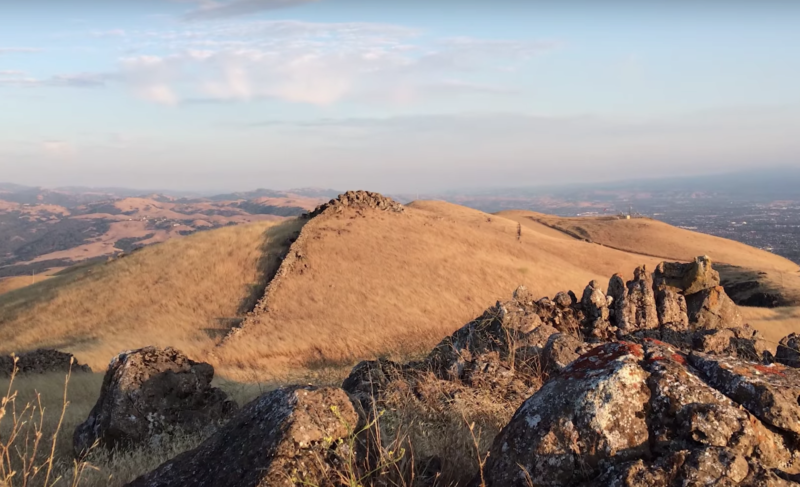 There are no accounts of them building massive wall structures or corrals or any of the other sort of rock features we see in the East Bay here." Fentress and other archaeologists who have studied and recorded the walls agree that there is an explanation, though. The rock walls were the work of us — the people who pushed the native tribes off the land. Fentress said some wall building may have begun in the Mission period, and walls like the ones in the hills followed. Some were likely built to mark property lines. Many others were put up as part of ranching and farming operations, such as those that were known to have existed both in the Berkeley Hills and the Monument Peak area. He also points to the many European immigrant groups known to have ranched and farmed in the hills. "Did these people make rock walls in their countries?" Fentress asks. "Look at them all — Portugal, Spain, Ireland, Germany, Switzerland and so on. Of course they made rock walls." Fentress and others also point out there was no shortage of labor — provided either willingly or unwillingly. Chinese crews, paid as little as a penny a linear foot, were hired to build ranch walls in Mariposa and Tehama counties, for instance. And many Native Americans, displaced from their lands and denied basic civil rights, were forced into indentured servitude to provide labor. But Fentress concedes his explanations for the walls are speculative and said you'd want to search for more evidence to back up what he and other researchers have observed and been told in the field. "The main thing to do would be to systematically record and map all the walls," he said. Once the walls were mapped, researchers could compare their locations to older maps showing historic property lines and other features. He also said it could be useful to dig along the base of walls to study their construction and to look for artifacts. It would also help to study the rocks used in the structures to confirm what most people assume — that they come from the same area as the walls themselves. Dating techniques could be useful, too. 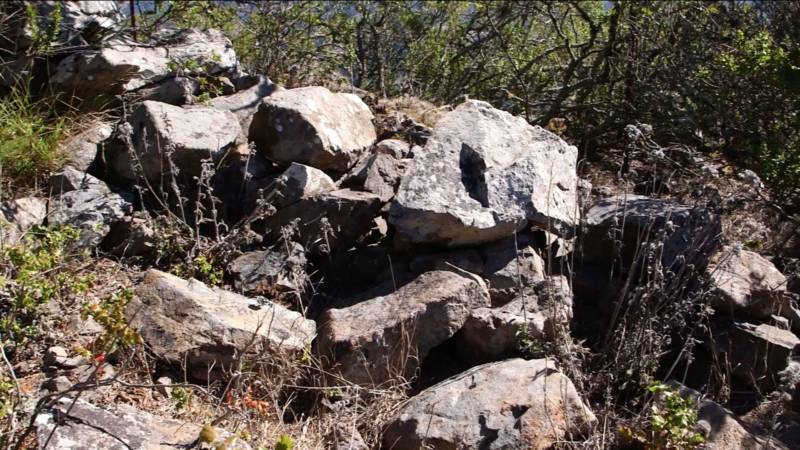 One experimental study that used the growth of lichens as a dating technique estimated that the surviving wall segment in the Berkeley Hills may have been built between 1850 and 1880. Fentress said you’d want to do a more systematic study — a hundred lichen sites, say — to really come to a firm conclusion. Historical records — written accounts — could be important, too. But those are in short supply. "And really the reason is that, you know, we’re looking at — you could call it the archaeology of the common people, the archeology of the working class," he said. "Back in 1850, if Mr. McGillicuddy cleared his fields and he built a wall between his property and Mr. Sousa next door, no one's going to write a newspaper article about that. It's not going to get in the history books. So all we have is the remains of these people showing their hard work and their ingenuity." o, at the end of all this, there is still some mystery left in the walls and more work to be done to come to definitive answers. Eric Haven, who prompted our own investigation, said he's OK with that. "People love a mystery," he said. "And since this is an unsolved mystery, it’s naturally evocative and compelling. I still think about it — a lot. And part of me somewhat hopes that we never find the answers, so that the Berkeley walls can always be a mystery."